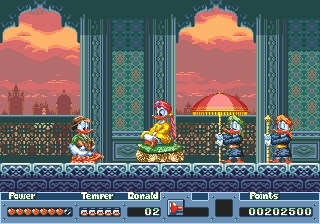 'Quackshot Starring Donald Duck' is an action based platformer that's known in Japan as 'I Love Donald Duck: Georgia ou no hihou'. But while the appreciation for the character is understandable does the game deserve such a flattering title? Disney, quite rightly, is very protective of their intellectual property. The corporation is intrinsically linked with wholesome family fun and if Disney doesn't like what you're doing with their characters or brands, they will not hesitate to pull the plug. It was something seen with BlueSky's original version of 'Aladdin'. Of all the characters associated with Disney, none is more protected than Mickey Mouse. You only need look at how much 'Epic Mickey' changed between concept and final release for proof of this. Warren Spector's dark re-imagining of Mickey was rejected and the game was released with a classic version instead. According to ‘Kingdom Hearts’ director Tetsuya Nomura, Square Enix could only include Mickey in one scene in this game. It is because of his inclusion that the main characters in ‘Kingdom Hearts’ carry swords stylised as keys. Disney is far more lenient when it comes to other recognisable characters though. While you’ll rarely see Mickey being that aggressive the same rules don't seem to apply to Donald who frequently acts for his own benefit, not caring too much for those standing in his way. The success of 'Castle ofIllusion' shows that Mickey Mouse can entice customers, but it's Donald that's far better suited to actions and behaviour typically seen in video games. When you compare 'Quackshot' to 'Castle of Illusion' you can see the two different approaches taken when creating games featuring Mickey and Donald. Both games were made by the same production company and both had designer Emiko Yamamoto at the helm. In Europe both were released in 1991 and they were even combined in a double pack years later. The two games are often associated with each other but while they are both platform based games, there's very different game play in each. 'Castle of Illusion' follows a tried and tested 'Mario' inspired recipe. Mickey ventures through fantastic worlds all to save a damsel in distress. While level enemies and end of stage bosses stand in his way, Mickey can defeat them by jumping on their heads or occasionally throwing marbles at them. 'Quackshot' however is a game built on less familiar foundations and it shows Donald doing things that wholesome Mickey never would. Donald carries a gun, admittedly it launches plungers, popcorn and bubbles, but regardless it's a brave choice for a Disney title. He also turns into an erratic ball of rage when he eats five chilli peppers. While Mickey would never behave like this it's befitting of Donald as the carton-shorts frequently show his temper dictating his actions. Although not a sweeping epic, 'Quackshot' has a much richer plot than other Disney licensed games of the 16bit era. 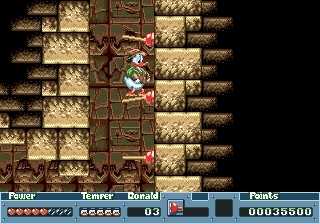 The game's logo makes it clear that the story takes inspiration from the original 'Indiana Jones' films; Donald is even wearing Indiana Jones-style clothing. An opening cut scene sets up the premise for what is to follow. It shows Donald reading a book that describes the life of King Garuzia, the ruler of the ancient Great Duck Kingdom. 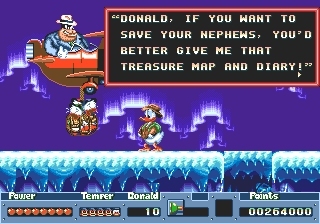 Among the pages is a map which leads to the location of the King's hidden treasure and Donald rightly thinks finding the lost riches will give him wealth comparable to his uncle Scrooge McDuck. For some contrived reason, classic Disney antagonist Pete overhears Donald's plan and hopes to find the treasure for himself. Donald searches through real and fictitious World locations in the hope of beating Pete to King Garuzia's riches. Over the course of 'Quackshot' he visits Duckburg, Count Dracula's Castle in Transylvania, an Aztec pyramid in Mexico, the palace of the Maharajah in India, an Egyptian temple, the South Pole and a haunted Viking long boat. Although pitched as a Donald Duck game, the majority of characters featured in 'Quackshot' actually come from the 'Duck Tales' TV series. It's hardly a surprise given the show was reaching a peak in popularity at the time and gamers had recently adored Capcom's NES based 'Duck Tales' tie-in game. Fortunately for those not well versed in nineties TV shows, alongside Huey, Dewey, Louie, Scrooge McDuck and Gyro Gearloose are more familiar characters like Goofy and Daisy Duck. Consequently knowledge of the 'Duck Tale' series isn't required to follow the plot of 'Quackshot'. The game initially seems open with a choice of three levels, but you'll quickly realise its entirely linear. In a 'Metroid' style, progression is only possible if you have a required item. Frequently you'll meet a character who cheerfully informs you that it's impossible to continue as something is missing from your inventory. Thankfully these points all coincide with fast travel flags, which means when you return to a level you'll start from a midpoint rather than the start. It is impossible to collect new skills in a non-prescribed order, which is fortunate because getting them prematurely would make this tricky game far too easy. Critics seemed surprised by the game's difficulty. 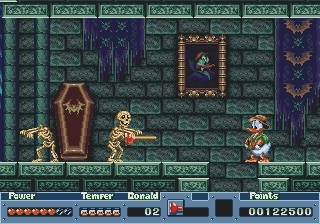 GamePro claimed that when compared to similar games, 'Quackshot' was "a million times harder even with unlimited continues". Sega Force similarly claimed 'Quackshot' is "so hard you'll be playing for weeks to beat it." They even questioned if the difficulty would be too much for the children that would be attracted to the main character. However much of the challenge is exacerbated by the game's controls and Donald behaves in an incredibly frustrating way. He is painfully slow. Although there's a dash button, this makes him behave like he is on ice and it's only marginally faster. 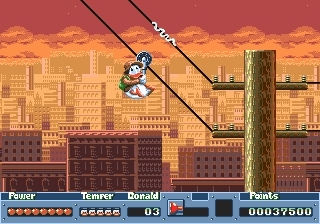 When it comes to platform games, precise jumping is essential and this is also a huge issue in 'Quackshot'. In a retrospective article the IGN website perfectly surmised the problems. "One of my complaints about 'Quackshot' both now and when it came out is that the platforming is a touch floaty" wrote Levi Buchanan. "It's far too easy to over- or under-shoot a narrow column and slip to your doom, especially since Donald does not stop on a dime. Too often you try to react quickly to keep from sliding off a ledge, but [avoiding death] feels completely out of your hands." But control shortcomings aren’t limited to running and jumping, much of what you're expected to do simply doesn't feel intuitive. Upon finding a gap that was smaller than Donald I spent far too long running back and forth to build speed thinking with momentum I could slide through. However, every time the down button was pressed the lovable Duck protagonist would grind to a halt. I had to shamefully look at an online guide to find out that my idea was right but my execution was wrong; holding down while pressing the jump button illogically causes a duck to slide on its belly it seems. However, once you know this slide move I guarantee you'll be using it all the time as it's much faster than walking. It's a move that's not even affected by environmental restrictions, even nullifying the slipperiness of snow. Sliding is also the best way to navigate underwater sections, which are quite frankly awful on foot. All of the control shortcomings are emphasised when submerged as Donald will move at five pixels per second with even floatier jumps. The terrible underwater sections are by far the low point of the game, which is surprising given that water is a duck's natural habitat. Like so many early platform games, enemy placement seems to be designed to rob the player of energy. Frequently foes lurk at the edges of a platform you need to jump to. Prior to getting the bubble gun (which kills them in one hit) the only way to stop an enemy is with the plunger weapon but this only temporarily restrains them. It can also not be fired at an angle so predictably by the time you've lined up a shot, restrained the enemy and then floaty jumped to the platform, they have started moving again. Fortunately to offset the cheap enemy placement there are copious amounts of health pickups. However, I surely can't be the only person to find it slightly uncomfortable that a duck would eat roast chicken to regain health. During the hour it takes to complete 'Quackshot', quite a lot of boxes on the "platform game faux-pas" list get ticked. There's a terrible section that sees you jumping across moving boxes that radiate out from a central point. If this wasn't bad enough at times you have to jump from these moving platforms onto other off-screen moving platforms. There's at least a consistent pattern to the motion but that doesn't stop it being merciless. Another frustrating part sees Donald traverses roof tops by clinging onto a wheel that zips along electrical wires. The problem is that touching a spark along the predetermined route will cause him to plummet from the wire to his death. You can alternate which electrical wire you travel along but transitioning between them isn't an exact science given the game's floaty jumping. Completion of this level requires route memorisation and pre-emptive action; neither of which is possible without many repeated plays. The problem is that the game feels repetitive already, simply because most stages demand you play through them twice: once to get to your objective and then again to return. Goofy may be lovable but when he's telling me "the only way out is to go back to the entrance" I want to do very un-Disney things to him! More minor but equally irritating is the inability to tell if a drop will instantly kill you or if it's the intended route through the level. There are also levels involving temporary platforms that sit above instant death lava pits and a flying section where instant failure is caused by hitting randomly appearing enemies. No one has ever enjoyed this sort of thing in a game so your heart sinks when you see them in 'Quackshot'. But despite all these short comings I can't help but think fondly of the game. 'Quackshot' is filled with inventive ideas, including a mine cart section and diverse boss battles (that require strategy rather than mindless repetition shooting). While it's a shame that a desire to be varied has allow for frustrating sections to seep in, you have to applauded Emiko Yamamoto and her team for trying to continually keep the levels diverse. Love for the game is certainly made easier due to its incredible visuals. "Graphically the game is one of the best looking games on the Genesis, with fantastic colour use" noted gaming historian John Szczepaniak. "The backgrounds are rich and alive, adding a lot of depth and atmosphere at every step along the way. Even though the game was released in 1991, it remains one of the very best looking titles ever put out by Sega on their 16-bit platform". 'Quackshot' is a game that manages to include a large main character sprite without the player's comprehension of the level being compromised. This may be because the game is so slow, but it meant at the time of release critics were blown away by the game's look. "The graphics in ['Quackshot'] are absolutely brilliant and easily match those of 'Castle ofIllusion'" claimed Mean Machines. The magazine loved the "superlative sprites and stunning backgrounds [which] give it an almost cartoon-like appearance." It was an opinion echoed by CVG who felt "The graphics [...] just get better and better. It turns out that Donald Duck is a top notch bit of Sega related japery." Ace Magazine even claimed "It's got the best graphics and sound that the [Mega] drive’s ever produced". But universal critical acclaim wasn't limited to 'Quackshot's visuals. Sega Force called it "a killer game for platform fans". EGM called it "the best Disney game so far, featuring not only the best all-around graphics, but also the best play technique!" Love for the game hasn't diminished over time either, modern critics seem equally enchanted. "'Quackshot' came at a time when Sega were definitely in their golden age, and they were able to make gold out of almost everything they touched" John Szczepaniak recalls. "It's not only one of the best Disney games ever made, but one of the best platformers on the Genesis as a whole." I do respectfully disagree with Szczepaniak though. 'Quackshot' is far too slow to top 'Castle' or 'World of Illusion', let alone challenge the supremacy of 'Ristar'. That being said it's still a great game and I certainly appreciate the varied gameplay and exploration. It's a game that isn't afraid to experiment and that means 'Quackshot' feels very different to 'Castle of Illusion'. While Disney may always play safe with Mickey, at least they were willing to experiment with Donald. It’s mean we can enjoy a fun and enjoyable hour with 'Quackshot'. I have to be honest, I had never heard of 'Quackshot' before I saw it on a multi -cart with 'Castle of Illusion'. Inexplicably this double pack was cheaper than buying the Mickey Mouse game on its own, so I essentially bought 'Quackshot' to save money. It may not have been my goal to play it, but I'm very glad I did; while queuing at DisneyLand Paris no less!